Acrylic Scoop Bins makes dispensing candy much easier. Scoop up more profits by displaying your products in these rockin' scoop bins. A variety of styles ensure the perfect look for any decor while attracting amazing attention from customers. A scoop bin gives your customers the convenience they want with easy access to your products. 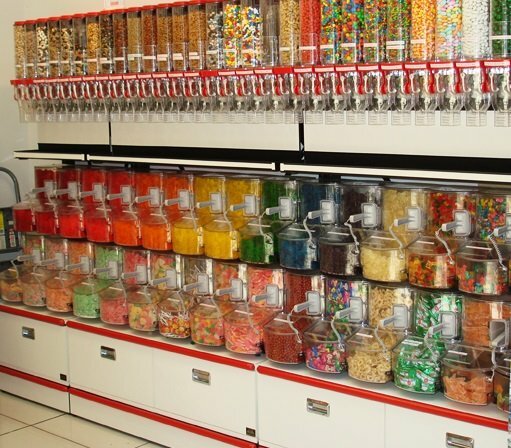 Bulk candy bins are a top notch inclusion in your decor and candy shop set up. Fill with lots of bulk foods and products; grains, coffee, candy, nuts and so many more items and increase your offering to customers. While a splendid display option for unwrapped candy, an acrylic scoop bin works well for other unwrapped edibles as well as non-food items such as craft supplies and novelties. 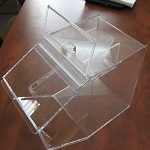 This type of acrylic container is extremely popular because of its durability as well as being an appealing display option. Looking for the perfect Bulk Candy Bins? Check out the Plastic Containers as well!